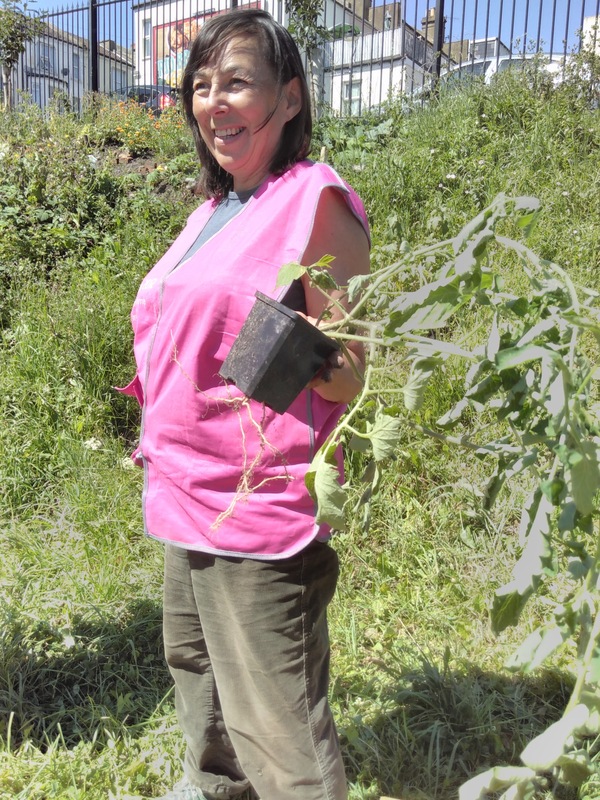 The new growing season is upon us and we are looking for keen volunteers to help the team at the community garden in St Leonards Warrior Square train station. The garden has raised beds for vegetables and lots of fruit tress and bushes where we are growing food that the public can help themselves to. 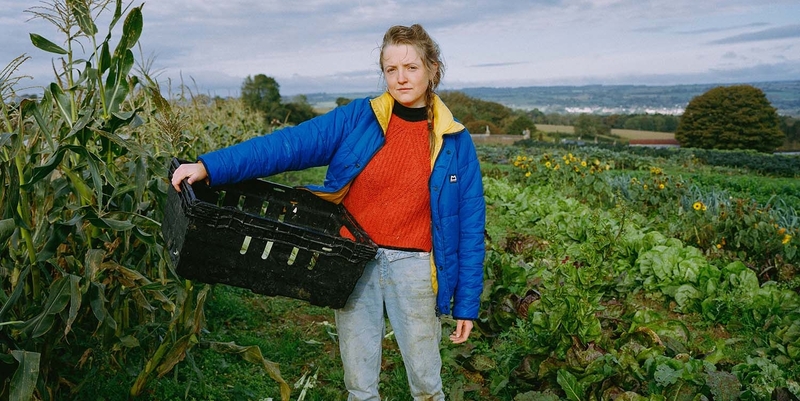 We want to improve the area around the station as well as show how you can eat more sustainably by growing organic foods collectively in the local area. Generally, we alternate weekly between Saturday (10-1) and Sunday (3-6) but always check the events page before coming to a session! Or email info@transitiontownhastings.org.uk if you have any queries. 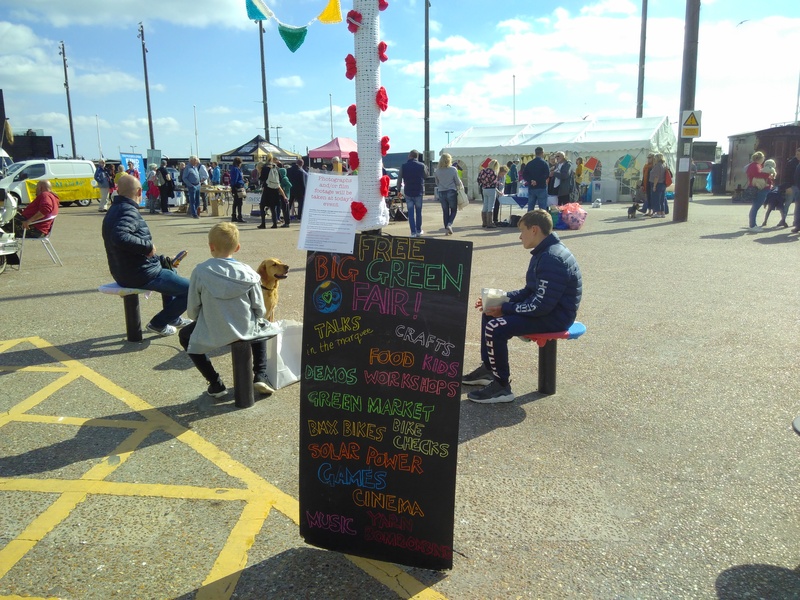 The Sustainability on Sea (SOS) festival acts as a showcase for local projects inspiring local residents, young and old, to learn, explore and try the latest in all things environmentally friendly, whilst also having fun. After a successful pilot of SOS Festival in September 2018, Transition Town Hastings, along with other local partners, have started planning for this year. The festival will take place between Saturday 21st–Sunday 29th September 2019, tying in nicely with World Car Free Day (Sep 22) and culminating with an all-day Big Green Fair on the 29th. The Green Fair will have stall holders, information stands, talks, activities for children and entertainment. The theme this year will be What we can do, encouraging everyone to live more sustainably, in small or big ways. Volunteer your time to help the festival team plan and run the festival. Take part as an organisation, school, community group, church group, local project or business. Plan an activity that we can add to our programme. Add an event or activity to the programme that you know is already happening. Sign up as a stallholder, information stand or activity for the Big Green Fair. Let us know of any burning ideas that you would like to try out as part of the festival. SOS is a Transition Town Hastings project in partnership with Hastings Furniture Service, Energise Sussex Coast and the Bexhill and Hastings United Nations Association. Refill Hastings has over 50 venues! Being a seaside town, Refill Hastings is very conscious of the issue of single use plastic. It washes up on our beaches on a daily basis. In the past Hastings has had a reputation for being a down and out seaside town but it is now experiencing a bit of a resurgence. It is a very creative and somewhat eccentric place and also has a very socially and environmentally aware and active community. 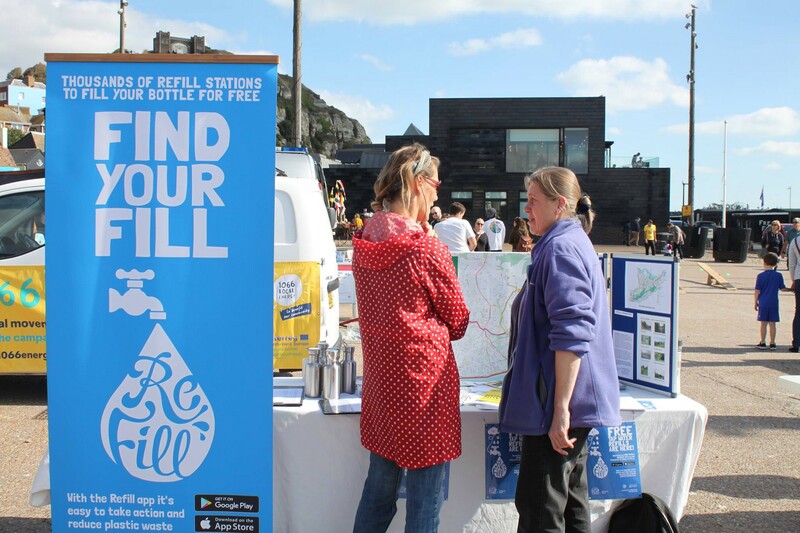 The Refill scheme was initiated by Transition Town Hastings and the local Green Party along with support from Surfers Against Sewage. These local groups (as well as the Marine Conservation Society) carry out beach and street cleans and often collect a lot of plastic waste. Launch of Hastings Refill at the Ocean Symposium, September 2018. 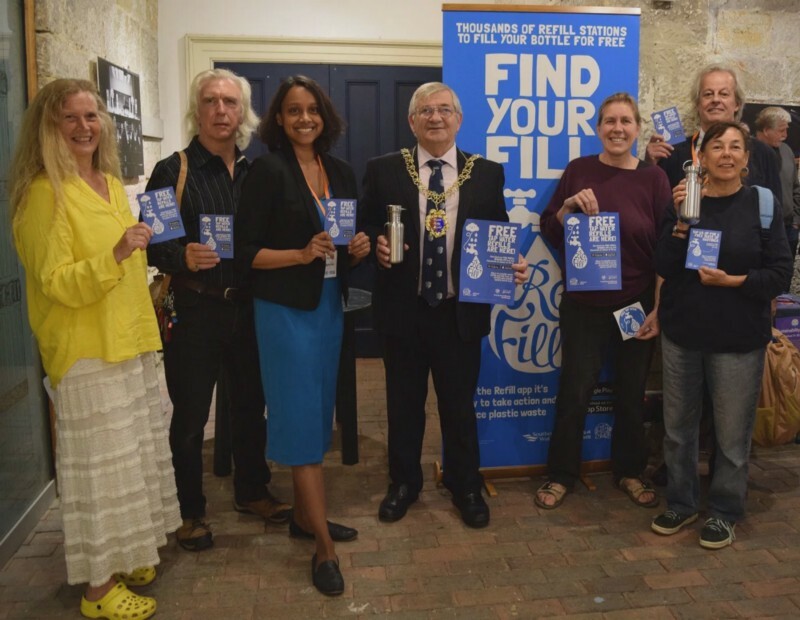 We’re a small group of volunteers and, so far, we have signed up over 50 venues in the local area to be Refill Stations. We launched the scheme at the Ocean Symposium at St Mary in the Castle in September 2018. Visit our facebook page or join the facebook group to get involved. So please take a moment to check out the Land Workers’ Alliance website and have your say before its too late. 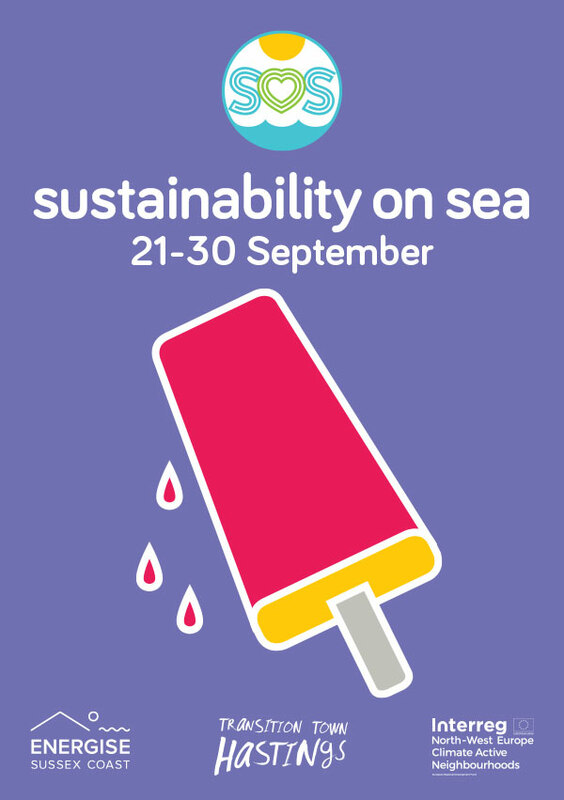 Sustainability on Sea festival this September! Transition Town Hastings and Energise Sussex Coast are jointly coordinating a new festival all about sustainable practices in the local area. Join us on Sept 21-30 for some inspiring events including nature walks, talks, demos, debates and tips on reducing plastic, a DIY solar workshop and more. 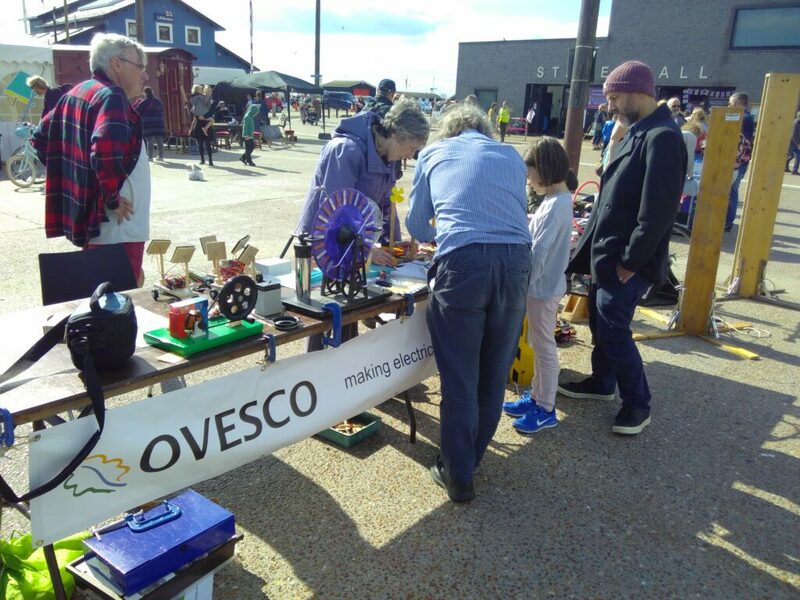 We are also proud to promote events by local groups such as Sussex Wildlife Trust, Surfers Against Sewage, OVESCO, Hastings Furniture Service and Pier to Eternity. The aim is to promote a sustainable future encouraging positive behaviour change and supporting and promoting those who are playing their role towards this goal. The festival finale event is a Big Green Fair on the Stade Open Space, Stade hall and Classroom on the Coast. The day will include talks, demos, art workshops, food workshops, bike checks, music, local information stalls and eco products for sale. Not to be missed! See www.sustainabilityonsea.org.uk for more details. On May 11th Julian Howell gave a short talk about cohousing projects and a very clear ‘how to’ to help groups to get started. Julian Howell is a founder member of Sussex Cohousing a Brighton-based community in the making. After the talk there was a lively discussion about what people were interested in doing locally. There was an interest in finding ways to live together in a supportive and collaborative way or living with a deeper connection to nature by sharing land. We hope the conversation continues and cohousing projects or land sharing projects can be realised in and around Hastings, a town where good quality affordable housing is hard to find. 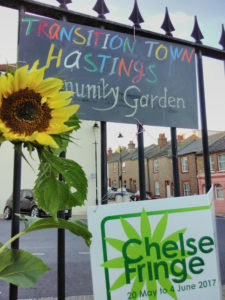 Sign up to the Hastings Cohousing discussion if you are interested in joining a conversation about cohousing in the Hastings area – a closed group on Groups.io. 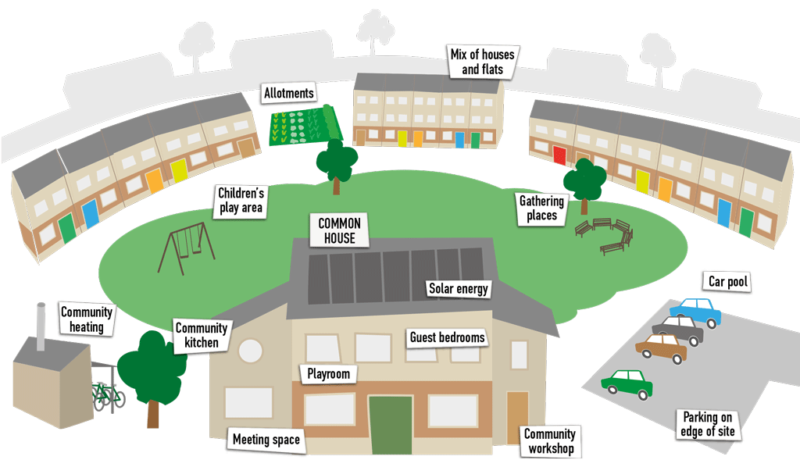 New Economics Foundation have recently published this guide to help groups looking to build community-led, affordable housing development in their area overcome one of their greatest obstacles: acquiring land. Great news. We were successful in our application for a Sustainability & New Economy Grant from Quakers UK. 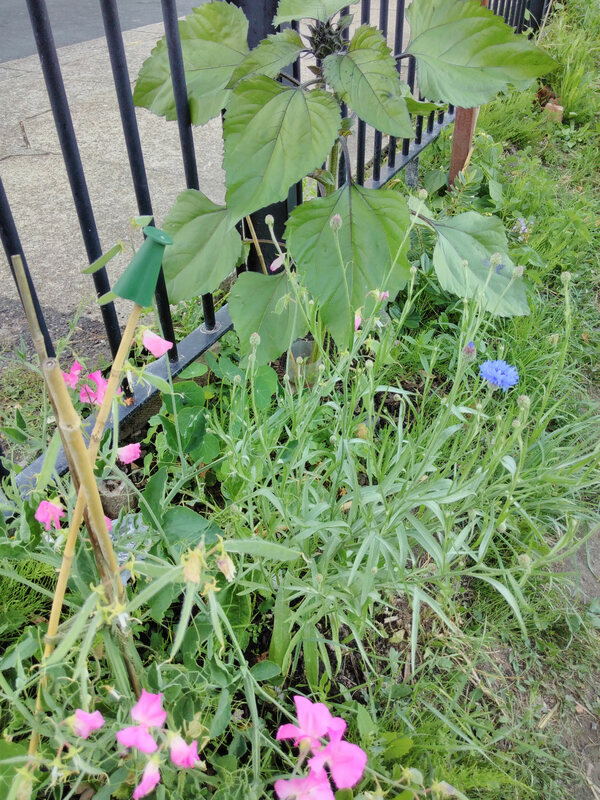 We will receive £200 to help fund the development of our community garden at St Leonards Warrior Square station, specifically around the water collection. There is no water supply close to the garden and we so for the past few years volunteers have been carrying buckets of water across the foot bridge to top up water needs over the spring and summer months. We’re really excited to be able to take control of the water supply by purchasing some large water butts for the north platform. These will allow volunteers to spend more time focusing on planning, designing and planting. Horticulture knows no such thing as time off. There’s work to do right now if you want your flowers and vegetables to enjoy lush, healthy growth when warm weather returns. Use the tips in this post as your guide to gardening success. Start your autumn chores by removing dead or dying plants from your garden beds. Give the remains a close look-see for evidence of mold or blight. If you see such signs, then burn the infected plants. If you don’t, then add them to the compost pile so they can work for you all winter long. Remove any foreign matter and give the soil a good, deep raking or tilling to break up clumps and aid aeration. Taking these steps now will lay the groundwork for next year’s harvest, according to the experts at Mother Earth News. Too much of anything is a bad thing; that includes mulch. You should add a thin layer to your beds on top of 1-2 inches of compost. Anything more can actually work against you by preventing the cold from killing mold and blight. While you’ve got your hands in the dirt, remove the roots of weeds like Bermuda grass and nutsedge. Otherwise these pests can overwinter in your garden to menace you next year, according to the gardening gurus at DIY Network. Hard winter soil can block rain and melting snow from nourishing the roots of your trees and shrubs, according to Better Homes and Gardens. 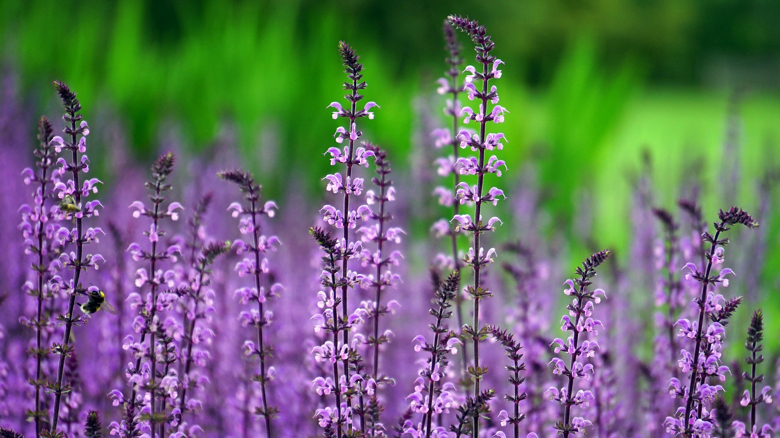 So get the jump on frost by giving these plants a generous watering now. This will act like the hump on a camel’s back, providing much-needed moisture throughout the cold season. Autumn is for fertilizing your grass. Turf can store nutrients over the winter, digesting them in a gradual process that will help to ensure greener results next spring. You should aerate your lawn before winter cold sets in. Plants like hairy vetch and cereal rye can safeguard your soil over a long, severe winter, making them good choices for cover crops. Just make sure you till them into the ground next spring before they go to seed. This is a favorite trick of organic gardeners, according to Rodales. The seeds are small and even modest rainfall can help to establish them in the soil, making this idea almost effortless to implement. An autumn inspection to correct imperfections that could lead to trouble down the road. For example, a crack in a walkway might seem like a small thing. But it may become a trip hazard should water enter it and freeze, forcing the stone or masonry to expand. You should also look, not only for cracks, but for soil or stone cavities alongside or under hardscape. Otherwise wintertime precipitation could fill the gap and turn to ice, creating a problem called “frost heave” which can damage or even destroy hardscape. A general sweeping to remove foreign matter, followed up with a washdown from a garden hose or pressure washer. This will discourage the growth of mold or mildew, which can deface hard surfaces. Performing these needed steps will protect your garden and your landscape features from winter’s wrath. So give it your best, then brush off the dirt off your pants and start planning for next spring. Ore Community Land Trust (OCLT) has a stated purpose of “Seeking to acquire land in the Upper Ore Valley to save and enhance urban woodland and green space for community use and to protect animal habitat”. OCLT was set up in 2009 and is now registered as a Charitable Incorporated Organisation (CIO). 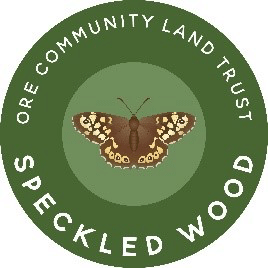 This widens their scope as they are keen to take on other green spaces and woodland in the Ore Valley, although their primary aim is to bring Speckled Wood into community ownership. 1) HBC is planning to transfer the green spaces in the Ore Valley over to OCLT. 2) OCLT are in the process of buying a container as a volunteer base in Speckled Wood. They need more volunteers to support this. 3) OCLT are working with TCV to organise some green gyms in Speckled Wood. The first one will be for women.